The Parental controls feature allows you to set restrictions to the Internet or specific websites on particular computers and devices. This article will discuss how to set up Parental Controls to block specific sites. NOTE: Parental Controls can be set up for a total of five (5) computers or devices and can block up to eight (8) URLs only. QUICK TIP: Blocking secured URL using the Advanced Restrictions > Website Blocking by URL Address in the router’s web-based set up page will not block a secured URL unless the user blocks port 443 (HTTPS) which will then block all secure websites. To learn more, click here. Launch the Linksys Connect software and select Parental controls. NOTE: To launch Linksys Connect on a Windows computer, go to Start > All Programs > Linksys Connect. To launch Linksys Connect on a Mac® computer, navigate to the Applications folder in Go, and then start Linksys Connect. If you need more help, click here. Create a Parental controls password and verify it. NOTE: This password will be used if you want to edit your Parental control settings. Enter a Secret question and Answer on the provided fields. Click OK to save the settings. Select the name of the computer or device you want to block these specific sites from and click OK.
QUICK TIP: If your computer is not listed on the screen, disable the firewall of your computer or make sure that the computer is connected to your network. NOTE: Parental Controls will detect computers or devices by its name. If your computer is connected through wired or wireless connection, you will see another name on the list. Click Edit beside Block specific sites. Enter the website address you want to block and click Save. NOTE: In this example, "www.facebook.com" will be blocked. Since we only need to block specific sites, leave Block Internet access to Never. Once the user tries to access the blocked website, they will be asked for the Parental controls password. If they are able to provide it, the website will be accessible for one (1) hour only. Access your router’s web-based setup page. NOTE: For detailed instructions on how to access the web-based setup page for Windows, click here. For Mac users, click here. Click the Access Restrictions tab and set the Parental Controls to Enabled. NOTE: In some routers, you need to click on the Access Policy tab and select Enabled for Parental Controls. Click Add under Target Devices. Enter your password on Parental controls password and Verify password fields. NOTE: This password will be used if you want to edit or disable your Parental Control settings. Enter Secret question and its corresponding Answer. Click OK to save the settings. NOTE: You will not see this page if you have already set up a parental controls password using Linksys Connect. If you forgot your Parental controls password and can’t remember the answer to your Secret question, the only way to change the password is to manually reset and reconfigure your router. To learn how to reset your router, click here. Select the name of the computers or devices that you want to block specific sites from and click OK. Enter the website address you want to block. Access the web-based setup page of your router. If you’re using Windows, click here for instructions. If you are using a Mac computer, click here. 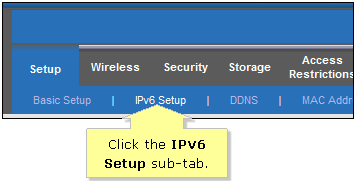 Under the Setup tab, click the IPv6 Setup sub-tab. In the Internet Connection Type section, select Disabled. NOTE: Some parental control features only block IPv4 websites and may allow access to IPv6 websites. To learn more about possible problems with IPv6 activated websites, click here. To learn about IPv6 supported Linksys devices, click here.